Do you have a favorite pumpkin carving tradition? For the longest time I have loved to buy those intricate carving kits, you know the kind you have to spend hours outlining with the little toothpick punch and then a couple more hours to actually carve...and by the end of the night it feels like your hand is going to fall right off! But a few years ago, I decided to leave my old ways behind me and try something less time consuming but a little more creative then your average Jack-o-lantern face. This technique is VERY simple, all you need is a drill and some x-mas lights. This technique uses a scraping method and is a little more tricky but not too bad. I would recommend buying a pumpkin that does not have a thick shell (although I'm not really sure how you can tell). It also helps to scrape the inside walls of the pumpkin very thin. Get the pattern to the right HERE. OMG, the first one is so beautiful! ♥ Great finding! 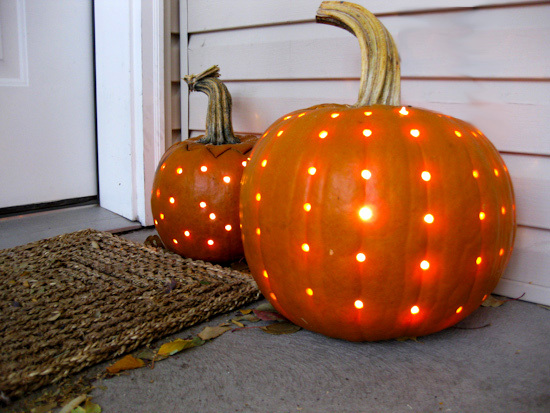 I love the pumpkins with the drilled holes! I think they are so classy looking - and easy to do! Teee hee!! I love the super happy pumpkin! My fall break starts today... I'm going to head to the pumpkin patch when I get home and carve some pumpkins! These are great ideas..
love martha & love that polka dot pumpkin! I love that first one. I saw Martha on the Today Show the other day and she punched different sized round holes in a pumpkin and stuck rubber rats going in and out. It was pretty neat (and easy!). Didn't even have to clean it out first. I SO want to drill holes in my pumpkins. LOVE THAT! I can't wait to carve mine this week. I did the hand drill hole one a few years ago and to this day it's my favorite pumpkin. Yours all look so great! I love the polka dot one, I have never seen anything like it before, I can't wait to try it! How does the pumpkin stay nice from year to year without shriveling up....is there a special step to keep it nice from year to year? Hi on fb, there was a procedure for soaking the pumpkin, carved out, in a solution of clorox and maybe vinegar with water. Supposed to kill the mold/bacteria. I could look it up. I love those pumpkin carvings! I really envy those who can carve as elaborate as those ones. But I think I'll take those simple and easy pumpkin carving ideas just like the first photo, that's all I can do as for the moment, LOL. Cheers and thanks for sharing! pumpkinpatchesandmore.org has good info. for killing the fungi that grow inside the pumpkin after carving, also,I have used Johnson Floor wax on the outside of the pumpkin and it keeps for a right good while. That would be an uncarved one. Thanks for sharing your pumpkin carving ideas. Keep sharing more awesome post. I really like thin polkadot lights! Tried this with a drill last year and it worked great. Pinned!I posted Boo-tifil IKEA pillowcase to skip to my lou this week. I do not know the tradition of carving pumpkins, but I only know the model of the current face-shaped pumpkin carving hellowen event because it's the most famous. and well known as solusi wanita frigid in our country. Whether you're a first-time pumpkin carver or an accomplished professional, we have all the pumpkin cutting tips to help you make a cool cut pumpkin to get everybody's consideration for Halloween. 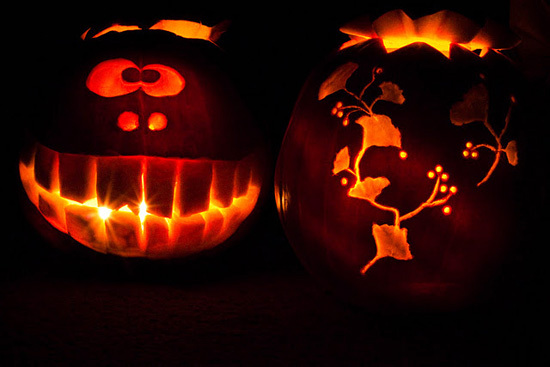 Pumpkin carving ideas for this 31st october because it is old traditional way to carve on halloween. An orange natural product reaped in October, this nutritious and adaptable plant highlights blossoms, seeds and substance that are palatable and rich in vitamins. This website has a nice handful of Free Halloween coloring pages Printables for adults that include patterns with hearts, butterflies, mandalas, flowers, birds, cakes, and faeries. To download the free coloring pages for adults at Faber-Castell, you'll need to click on the image which will then open a PDF file of the coloring page that you can print.